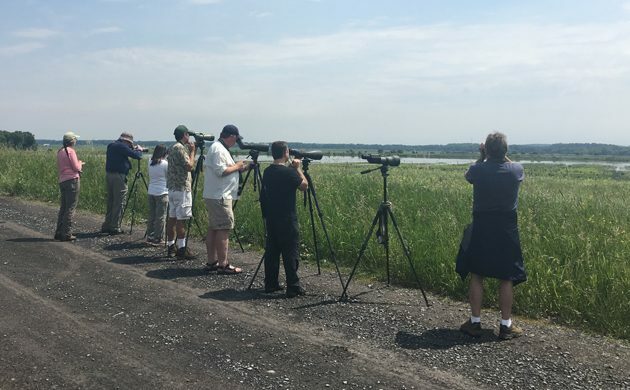 On Sunday, 5 June, word of Jay McGowan finding a Gargeney at Montezuma National Wildlife Refuge in western New York State hit the listservs. Lots of birders got to see it that day, the next day, and all week long. I had to work all week and my first shot at this potential first state record wasn’t until Saturday. Fortunately (for me) Anthony Collerton had made an attempt on the bird earlier in the week but had dipped, only to learn that it was seen several hours after he left. So he agreed to make another attempt on Saturday and take me along for the ten-hour round-trip. I arrived at Anthony’s place on the west side of Manhattan at the relatively civilized time of 6 AM. We were in no rush to get to Montezuma as the bird was typically spotted in the afternoon because the sun made for horrible viewing in the morning hours. So, of course, a couple of hours into the drive the bird was seen by a host of birders who quickly reported it to the listservs. Now, it’s better to get word of a bird’s presence when on a long distance twitch than to get word of a bird’s absence but it does add to the pressure. After all, we now knew the bird was still present. What if we missed it? But before we get into the search I’d like to touch briefly on the bird itself. I’d only ever seen Garganey once before, way back in 2009 in Kazakhstan. Its a Eurasian bird, migrating from Africa and south Asia every spring. There are quite a few records from Alaska, mostly in fall, and a scattering of records on the east coast, mainly in spring. This bird fits that spring pattern of natural vagrancy quite nicely and no sign of captive origins have been detected, which is nice because any out-of-place waterfowl can be considered suspect. Enough about the bird…what about the birders looking for it? Out of the car frantically getting scopes set back up and yes! Garganey! The little tiny duck with the white supercilium was ours! Much happiness and celebration ensued! Anthony had spotted the bird back in the reeds and announced it only to see a Wood Duck swim out. He couldn’t figure out how he had botched the identification so badly when the Garganey followed the Wood Duck out of the reeds. Even knowing the bird was present it was still a difficult bird to find with the distance and the heat haze to contend with, and there were even folks who had the bird in their scopes who couldn’t see it. But, eventually, everyone present got on the bird and all were happy. Yeah, the bird was distant. But I included a Wood Duck for scale! After the celebration we took a short drive to where the Prothonotary Warbler was reported and picked that species up for the year as well, to say nothing of a singing Cerulean Warbler and a Black-billed Cuckoo. It was a nice trio of birds to top off an excellent day of birding. You’ve seen more birds in New York than I’ve seen in any one country. 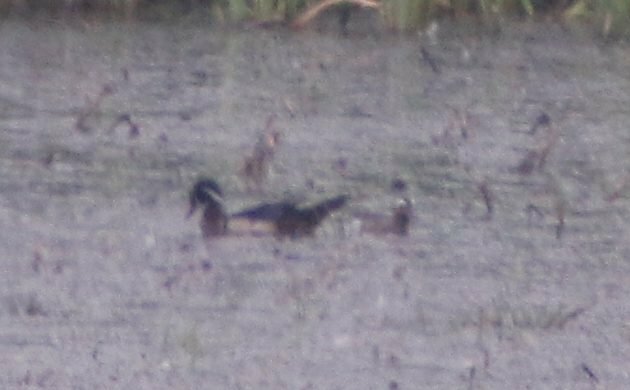 It took me a while to even see the Garganey, and when I first saw the photo without reading the post, I though “Surely he can’t have gotten that ID wrong!!??”. So happy we weren’t the sacrificial birders! I hope Mike Powers saw it the next day.